What does “floriental” mean to you? I think of a warm, ambered fragrance with a classic floral heart and a touch of fruit. I count on baroque flourishes and maybe even a bottle with a tassel dangling from its neck. It won’t surprise you that Comme des Garçons Floriental is none of that. Instead, Floriental purports to center itself on a flower with no scent — the cistus flower — and it is straightforward and linear with a decidedly urban edge. No tassels here. 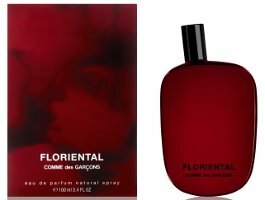 Floriental’s notes include labdanum, sandalwood, vetiver, incense, pink pepper and plum liqueur. You’ll notice the absence of floral notes in this list, and I don’t smell anything blatantly floral in Floriental, either. Instead, I get a sharp, incense-tinged top floating above a sweet, round sandalwood base with a touch of spice. And that’s about it. No flowers, no fruit (despite the mention of plum liqueur), and no traditional floriental (little “f”) fussiness. Despite being named after a style of fragrance that personifies prettiness, Floriental doesn’t seem to aim to charm. If it wasn’t from Comme des Garçons and cleverly named Floriental despite its lack of obvious floriental-ness, I’m not sure I’d find much in it to interest me. However, I’m not especially good at pulling off this sort of artistic statement. In the end, I just want to smell good. 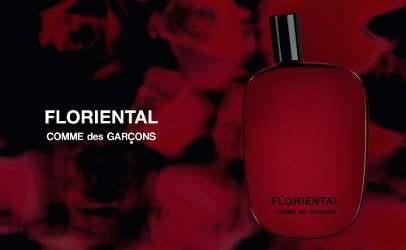 Comme des Garçons Floriental was developed by perfumer Émilie Coppermann. It is available in 100 ml Eau de Parfum ($131); for buying information see the listing for Comme des Garçons under Perfume Houses. They definitely seem to like edgy approaches to clothing and fragrance, so I think a non-floral floriental was a choice. I wish I knew more about art criticism. Maybe I’d have something smart to say about this! I love my tassels, too! All the CdGs are worth smelling, I think, even if in the end I only end up wearing some. Oh, you should definitely smell it. If you do, please let me know what you think. What a shame. Labdanum is one of two essential oils rendered from Cistus. Labdanum is made from the sap or gum these shrubs exude and Cistus EO is made from the plant entire. Labdanum is one of my favorites and while it has it’s turpey aspects it should not be sharp or grating. I love it mixed with frankincense and I layer it under Dev 1 because sometimes a girl has gotta get her smokey- woody-resins jones on! Maybe you’ll love Floriental! To me, the top is a bit too grating. I never thought it might be from the labdanum, though. Bummer. I like the smell of straight labdanum but this sounds lame. Well, to me it’s more “statement” than “traditional beauty,” but others might disagree.